There is more information available on this subject at Mount Kilimanjaro on the English Wikipedia. Were you looking for the Killimanjaro Medal? Mount Kilimanjaro viewed from the banks of a river on the southern slopes. Mount Kilimanjaro is a stratovolcano located in Tanzania, near the border of Kenya in the East African Protectorate. One of the Earth's most famous mountains, it is the tallest mountain in the African continent, and the tallest free-standing mountain in the world, at approximately 5,895 meters (19,341 feet). Its name translates roughly from Swahili into "White Hill." The Librarian at Mount Kilimanjaro, moments before her death as the Halo effect strikes Earth. During the final hours of the Forerunner-Flood war, the Librarian oversaw the construction, activation, and burial of the nearby Ark portal. After destroying her Keyships, she spent her last days near the mountain. She described Kilimanjaro as "a beautiful thing - a snowcapped sentinel". In the 24th century, melted water from Kilimanjaro was collected by the Global Water Campaign's Mount Kilimanjaro Water Plant, processed and sent along the GWC Trans-African Pipelines along the Tsavo Highway for use across the rest of the African continent. By the 26th Century this facility has fallen into disrepair and is overgrown in jungle after more than a century of neglect. One of GWC's installations, the A2 Hydroelectric Facility, was still operational by the 26th century. On November 17, 2552, John-117 crashed to Earth close to Kilimanjaro, with UNSC Marines assisting the Spartan in evading Covenant occupiers and clearing much of the jungle near Kilimanjaro of the Covenant presence before being extracted. In 2557, 343 Guilty Spark led the crew of the Ace of Spades to a Forerunner facility hidden beneath Kilimanjaro in search of the Librarian. The crew discovered a platform with a Lifeworker pod containing a personality imprint of the Librarian. As the crew was surrounded by Spartans, Spark entered the hard light beam to speak to the Librarian who helped Spark to realize that the Ace of Spades crew were the friends that he had been looking so long for. The Librarian's imprint departed for the Absolute Record with her pod launching into space, something that was witnessed by several hundred people. The Ace of Spades crew were able to use a translocation pad to escape the mountain and return to their ship while ONI gained control of the facility. 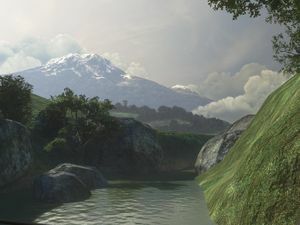 The level Sierra 117 of Halo 3 is set in the jungles near Mount Kilimanjaro. If a player gets 7 (five in Halo: Combat Evolved) kills within 4 seconds of each other, they get the medal Killimanjaro. The medal has existed since Halo: Combat Evolved, but few have legitimately earned it in regular multiplayer - it is considerably easier to get in Firefight. In similar vein, Halo: Reach also introduced Skullamanjaro, a legendary Headhunter medal obtained by winning a game by returning 10 skulls at once.